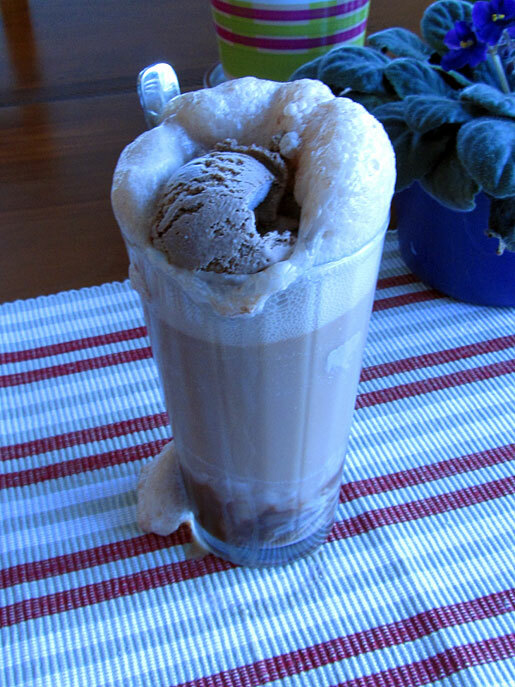 I made this ice cream so I could have a chocolate ice cream soda. Sometimes a woman just needs chocolate to get through the day. Put the milk in a sauce pan and sift the cocoa into the pan. Sometimes there are hard bits and they won't dissolve, so sift. It will take less than a minute and you'll be happy. Add the sugar and the salt and heat til nearly boiling. Stir to combine the chocolate. In a separate bowl whisk the egg yolks together. While whisking the egg yolks, slowly and I do mean slowly, add a bit of the hot chocolate mixture into the eggs. If you put it all in at once you'll scramble your eggs and that makes pretty poor ice cream. After about ¾ of a cup has been put into the yolks, you can add the chocolate more quickly but continue to whisk. When all the chocolate has been added to the egg whites, Place the mixture back into the pan and put it back on medium heat. Continue stirring until the mixture coats the back of a wooden spoon and you can run your finger through it and it leaves the trail. Don't overcook or again, you'll get scrambled eggs. When the custard is done add the vanilla extract and strain it into a heatproof bowl or measuring cup and chill. I know this sounds complicated but honestly, it takes less than 10 minutes to get to this point. When the custard is chilled add the cream and place into your ice cream freezer and follow the manufacturer's instructions.